Jolly Rovers Trail Crew Inc. Jolly Rovers Trail Crew Inc.
To create beautiful and sustainable trails to iconic places in public parks. We specialize in providing sustainable public access to popular park attractions; beautiful vistas, waterfalls, and historic sites are just a few of the destinations that bring people out to our parks; we create the path to get them there. With an emphasis on stonework, we’re a niche in the world of conservation, and we have a passion for making unique trail experiences a reality. We pride ourselves not only on the high caliber of our work but in the community we foster within our organization. It's not just about the work for us, but the way we do it. During our trips, emphasis is placed on team building and collective creativity to produce not just beautiful trails but camaraderie and friendship through charity. Free training is provided onsite to all interested volunteers. Once trained, you will be amazed at what you and the rest of your fellow crew members can build. What we leave behind is a legacy that will be enjoyed by the public for centuries to come; we hope that you will join us on this journey. 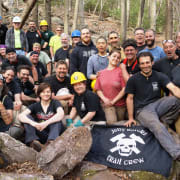 Would you recommend Jolly Rovers Trail Crew Inc.?